Be the first to share your favorite memory, photo or story of Alden. This memorial page is dedicated for family, friends and future generations to celebrate the life of their loved one. 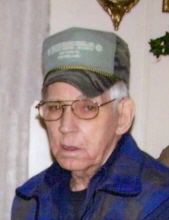 ALDEN SISK JR. “JUNIOR”, 82 years of age of the Garden Creek section of Oakwood, VA, went home to be with the Lord, Wednesday, April 10, 2019 at his home following an extended illness. Born November 10, 1936, he was the son of the late Alden Sisk and Mary Nell Sisk Dye. He was a lifelong resident of Buchanan County and was a loving father, grandfather and friend. He was a coal miner and coal truck driver, and was an avid motorcycle rider and coal truck lover. In addition to his parents, he was preceded in death by his step-father, Kenneth Dye; Sister: Janice Keen; 2-Brothers: Larry Sisk and Jerry Sisk; Son-in-Law: James Larry Duty; Granddaughter: Jodi Caye Sisk. Those left to cherish his memory include his children, Timothy (Carolyn) Sisk of Oakwood, VA, Trudy Sisk of Drill, VA, Rick (Margaret) Sisk of Drill, VA, Jacqueline Sisk Duty of Hurley, VA, Johnny Sisk of Drill, VA, Allen (Sherry) Sisk of Honaker, VA, Melissa (Benny) Lester of Drill, VA, Billy (Margaret) Sisk of Drill, VA; 3-Brothers: Keith (Debbie) Sisk of Illinoi, Billy (Sue) Sisk of Council, VA, Ronald Sisk of Pounding Mill, VA; 1-Sister: Norma Jean Thomas of Indiana. Also, survived by 18-Grandchildren, 16-Great-Grandchildren and Special Friends: Teresa Gail and Kenneth Stiltner. Funeral Services for ALDEN SISK JR. “JUNIOR” will be conducted Monday, April 15, 2019 at 11:00 A.M. at the Grundy Funeral Home Chapel with burial following at Greenhills Memory Gardens, Claypool Hill, VA.
Friends may call at the Grundy Funeral Home Chapel Sunday evening at 6:00 P.M. Active Pallbearers will be Darrell Presley, Dustin Sheppard, Johnny Couch, Nathan Reynolds, Ethan Kiser, Timothy Sisk Jr. and Brandon Stiltner. Special Thanks to Alden’s Hospice Nurses for the care and love they gave during his time of need. Grundy Funeral Home of Grundy, VA is honored to serve the family of ALDEN SISK JR. “JUNIOR”. To plant a tree in memory of Alden Junior Sisk, please visit our Tribute Store. "Email Address" would like to share the life celebration of Alden Junior Sisk. Click on the "link" to go to share a favorite memory or leave a condolence message for the family.